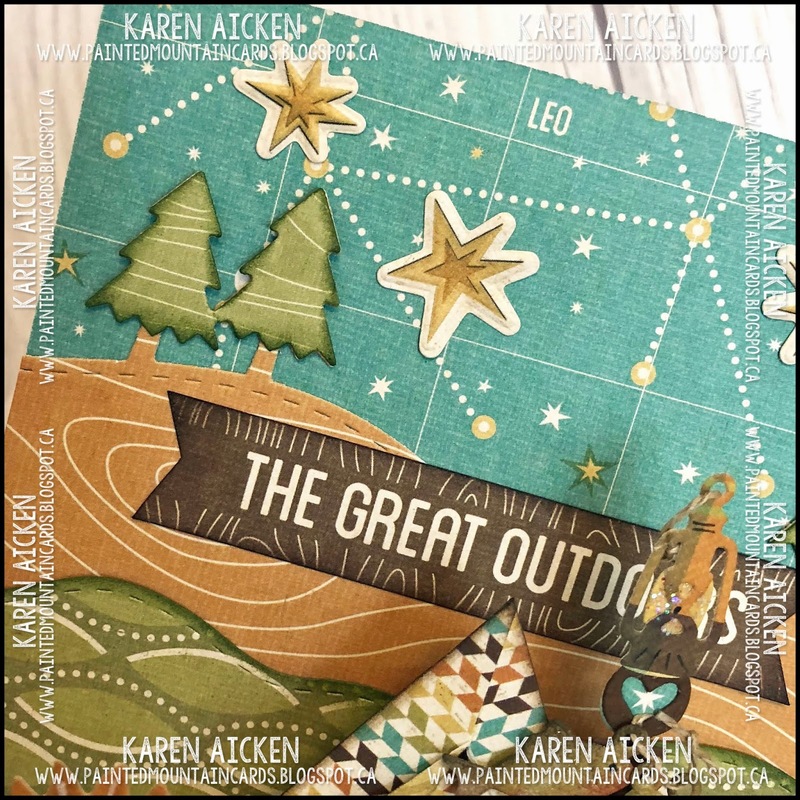 Welcome to Karen Burniston's June Designer Challenge - this month the challenge is: "The Great Outdoors". The new release is shipping this week and the new Tent Pop-Up is going to be VERY popular. I wanted to use it for my challenge card but show you a different way you can use it. 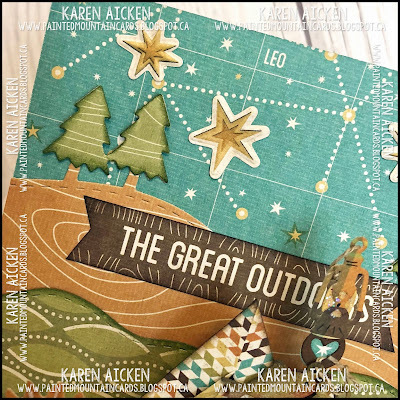 I have had this camping/outdoors themed paper pack for a couple of years, so pulled it out and got to work. I like to keep the fronts of my cards fairly simple when all the fun is on the inside. I cut the banner from the Word Set 5 Royalty and adhered it over the puffy camper sticker to hide the words that were printed on it. Then I cut the 'enjoy' from the new Word Set 6 Summer from patterned paper and again from fun foam. Adhering them together gave the word lots of dimension. I had so much fun putting this together! I used the floating floor from the House & Fence Pop-Up and used just the front of the tent. The tent flaps were tied back with fine jute twine then I adhered a hand cut triangle behind the opening with foam tape for dimension. The treeline and hills were cut using the Nature Edges die set and I did a little paper piecing on the trees. Then I added some puffy star stickers to the sky. 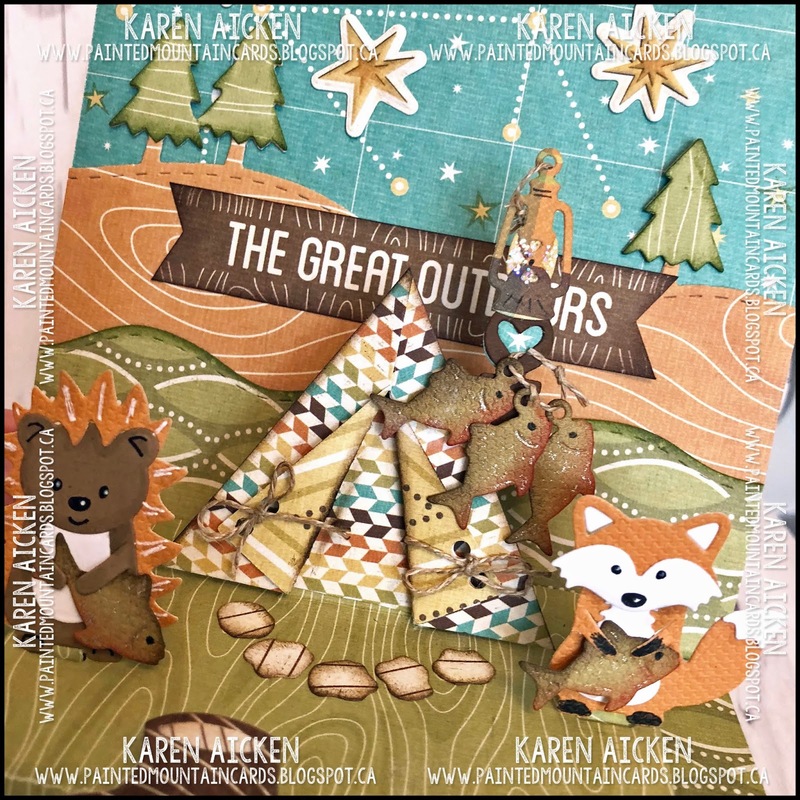 To make the tall lantern, I used the stir stick from the Coffee Cup Pop-Up and adhered the smallest lantern from the Camping Charms to the top. I tied a little loop of fine jute twine through the loop at the top and let it hang loose. Then I cut three fish, inked and sparkled them, they strung them on another loop of the same jute. Looks like the racoon and the hedgehog have been busy fishing, as they each have a fish to add with the others. Finally, here is a side view so you see the pop-up and dimension a little better. 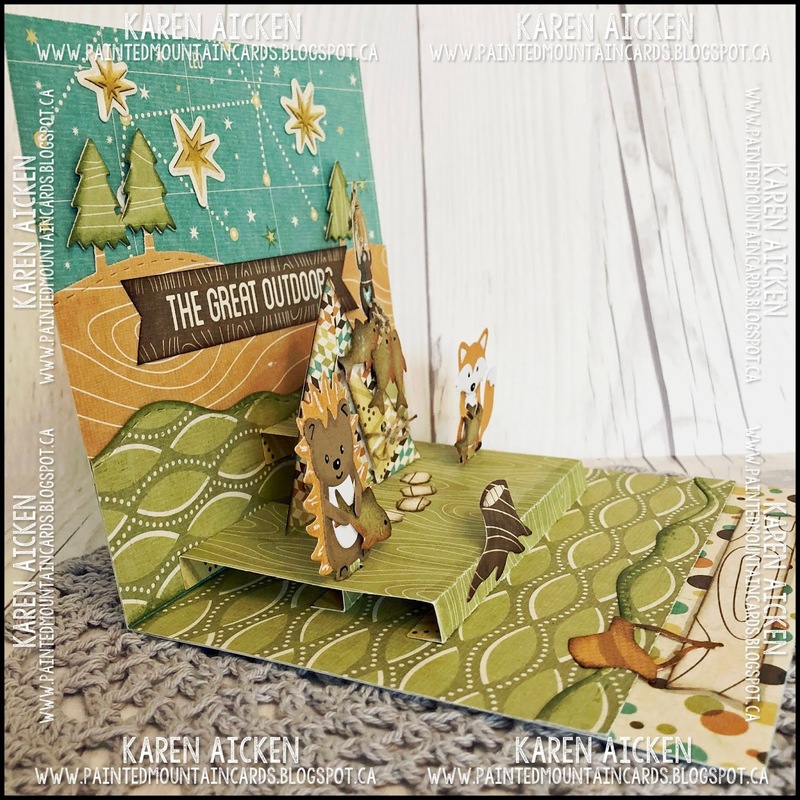 **For this card I used the squirrel belly on the fox. Don't be afraid to mix things up! 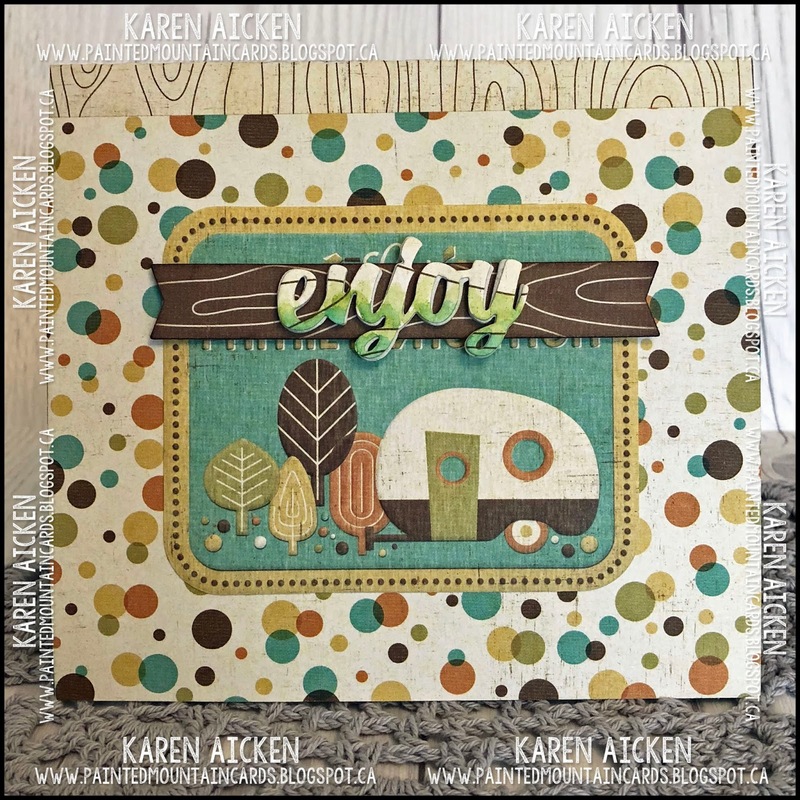 **The sign was fussy cut from a printed border on one of the sheets in the paper package. **Unfortunately after opening and closing the card several times, the base of floating floor started to crack. Usually washi or micropore tape on the back side of the score line helps if your card stock/patterned paper is prone to cracking but the card was already assembled. So I carefully painted some gel medium along the folded edges but will make a point to double check for cracking before cutting a Pop-Up mechanism.. A lot of DCWV patterned papers crack, but I didn't think the We R Memory Keepers would also crack. Now I know! I hope you will check out the rest of the Design Team posts - their blogs are linked on the right. 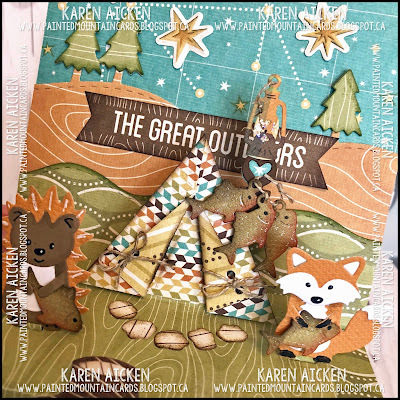 Karen Burniston will have her project on HER BLOG tomorrow (Wednesday June 6) and she will also share the teams posts. It's always fun to see them grouped together in one post. 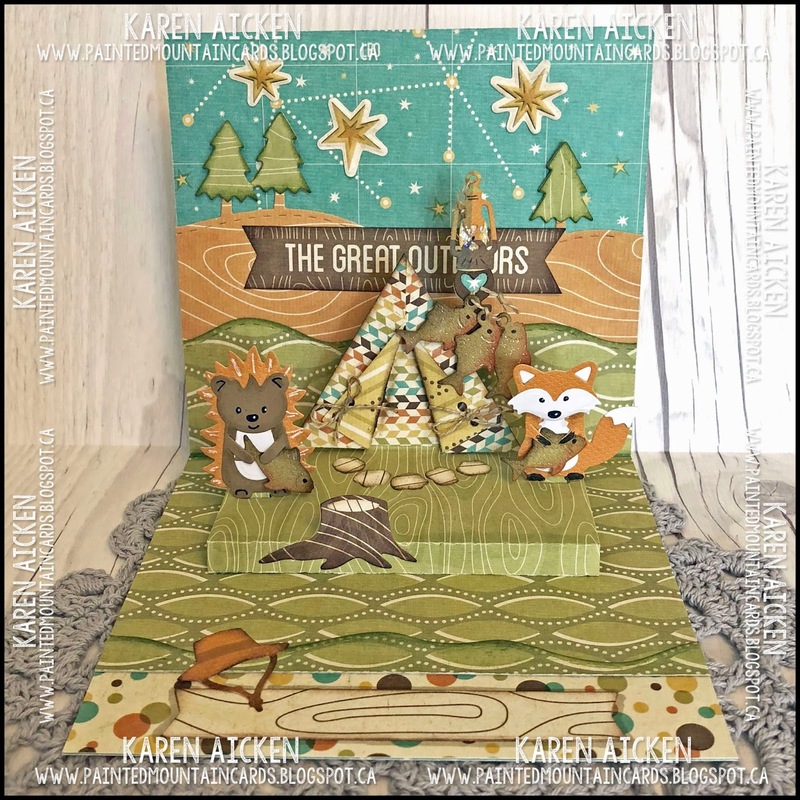 I like how you incorporated the woodland animals into your tent scene. The papers really make the scene. I've never seen the floating floor.....very cool. Love seeing new ways to use the dies I already own. Fun card!